Francis Johnson Webb, newspaper editor, educator, equal rights activist, and the second published African American novelist, was born free on March 21, 1828, in Philadelphia to Louisa Burr and Francis Webb. His mother, Louisa Charlotte Burr (c1785-1878), was the illegitimate daughter of former vice president Aaron Burr. His father, Francis Webb, served as founding member of the Pennsylvania Augustine Education Society, secretary of the Haytien Emigration Society, and Philadelphia distribution agent for Freedom’s Journal, the first black newspaper in the nation. Little is known of Frank J. Webb’s education other than what can be deduced from his later creative output. In 1845, at the age of seventeen, he married Mary, rumored to be the daughter of Spanish General Baldomero Espartero, and an African-born fugitive slave. From 1850 until 1854 Webb worked as a commercial artist and designer in Philadelphia. In 1854, he gave a lecture “The Martial Capacity of Blacks” to members of the Banneker Institute. That same year he published his emigrationist views in a colonization paper in Norristown, near Philadelphia. By the 1850s Webb associated with other abolitionists including William Cooper Nell, Robert Morris, Charles Sumner, and Frederick Douglass. 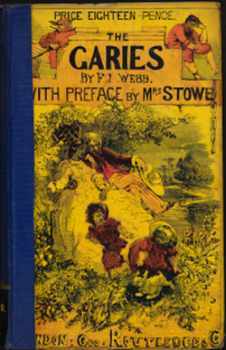 Frank Webb began his anti-racist novel The Garies and Their Friends in the mid-1850s The Webbs lived in London for about eighteen months from 1856 through 1857 and moved easily in aristocratic circles. Webb’s novel was published in London by George Routledge in the fall of 1857 and was well received. The couple spent several months in the winter of 1857-58 in Cannes on the French Mediterranean because of Mary’s declining health before moving to Kingston, Jamaica, where Frank had been appointed by the British Colonial Office as the city’s Postmaster. Mary’s health did not improve in the warmer climate and she died the following year. Webb lived in Jamaica for eleven years. He became a planter and married Mary Rosabelle Rodgers. With the exception of a year (1870) in Washington, D.C., clerking in the Freedmen’s Bureau and contributing to Frederick Douglass’s New Era, Webb spent the last twenty-three years of his life in Texas, working first as a newspaper editor, then as a postal clerk, and finally for thirteen years as principal of the Barnes Institute, a school for colored children in Galveston. Frank J. Webb died on May 7, 1894, in Galveston, Texas. Mary Maillard, “‘Faithfully Drawn From Real Life’: Autobiographical Elements in Frank J. Webb’s The Garies and Their Friends,” The Pennsylvania Magazine of History and Biography (July 2013); Phillip Lapsansky, “Afro-Americana: Frank J. Webb and His Friends,” Library Company of Philadelphia: 1990 Annual Report (1990); Eric Gardner, “Webb, Frank J.,” American National Biography: Supplement 2, eds. Paul R. Betz and Mark C. Carnes (New York: Oxford University Press, 2005).